It’s mainly a closed-loop system, independent and balanced. Each element composing the forest generates resources for other components, forming that way symbiotic relationship. The energy is directly captured from the sun for almost all its components. The roots pick up the water from the permeable soil. 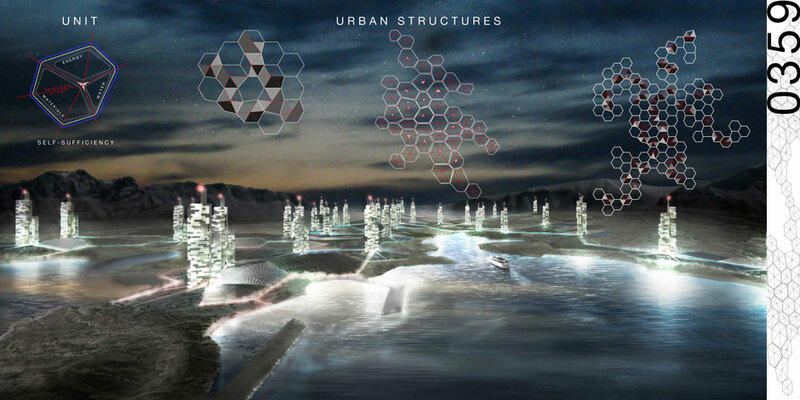 A city is usually an open-loop system, dependant and unbalanced. 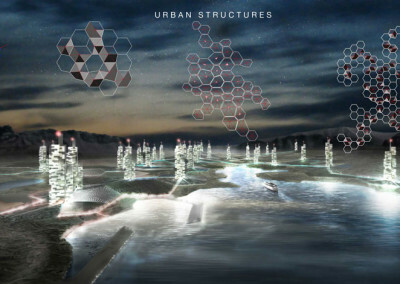 Each element composing city generates waste for the rest of the components, thereby forming parasites. The energy isn’t captured by its components, is centralized and later on transported, loosing that way two thirds of its amount. The water flows through impermeable surfaces and is collected by sewers to be transported, processed and discharged. Can a city be a forest? The 0359 proposal aims to approach the issue. 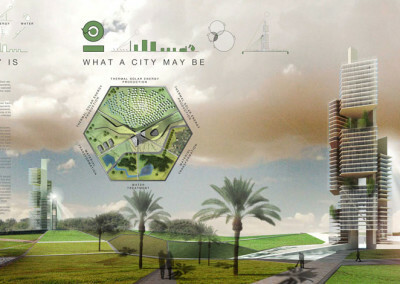 Based on closed cycles, water, energy and materials are produced and transformed on the same urban unit. Materials management is performed by the unit and the waste generated is converted into resources. This is essentially a no leaks system. Water is collected, processed through natural filters system and stored in natural lakes. It minimizes the territory impermeabilisation. 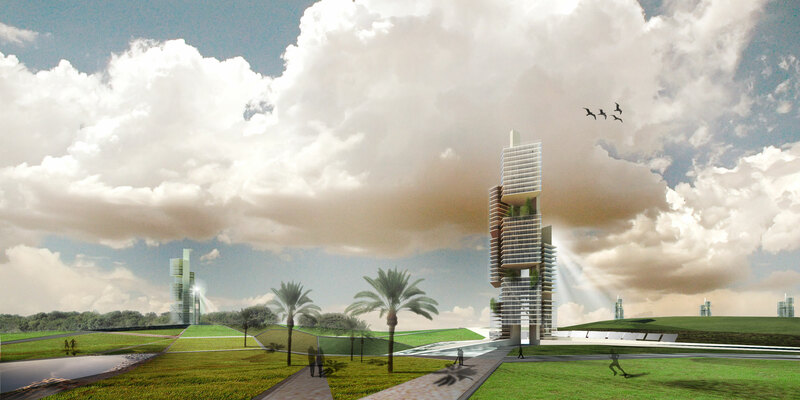 Each building in tower incorporates a thermal solar energy plant able to produce enough energy to be self-sufficient, however is connected to a general network to provide surpluses of production. Nowadays modern cities propose mix of different social uses as essential point to develop better urban spaces. 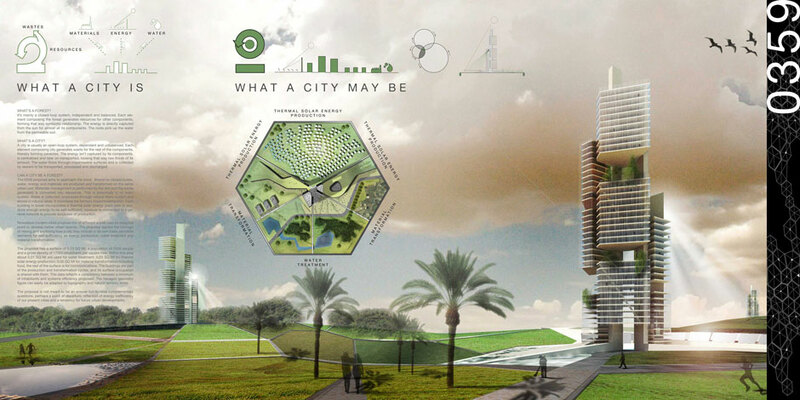 The proposal applies the concept of mixing and exploring how a city may include in its own basic structure elements for self-sufficiency as energy production, water treatment and material transformation. The proposal has a surface of 0,10 SQ MI, a population of 2000 people and a gross density of 17000 inhabitants per square mile. Within this area about 0,01 SQ MI are used for water treatment, 0,03 SQ MI for thermal solar energy production, 0,05 SQ MI for material transformation including food, the rest of the surface is for communications. The buildings are part of the production and transformation cycles, and its surface occupation is shared with them. This data reflects a consistency between a minimum of inhabitants and systems efficiency proposed. The hexagon geometry figure can easily be adapted to topography and natural territory limits. The proposal is not meant to be an answer but to raise complementary questions, perhaps a point of departure, reflection of energy inefficiency of our present cities and a tendency for future urban developments.